Atria Books/Beyond Words, 9781582704906, 240pp. Do you suffer from neck pains? Go to the chapter on Taurus and the neck. How about sore knees? Learn preventive tips and exercises in the Capricorn chapter. 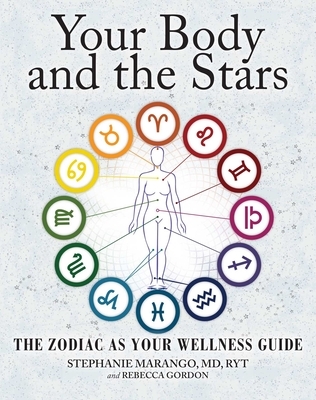 Your Body and the Stars is the first comprehensive reference guide to go deep into the twelve zodiac signs and the specific body region each sign represents—from your head down to your toes. You can utilize this book by identifying your birth or sun sign and by the body region that needs healing attention. Each chapter integrates a self-directed program and holistic approach to health—both your emotional or mental well-being as well as the physical health of your body. Practical end-of-chapter tips, questions, and illustrated step-by-step exercises based on a mix of yoga, stretch and strengthening movements, and Pilates are provided for all levels. Stephanie Marango, MD, RYT is a holistic physician and educator trained at Stanford University and the Mount Sinai School of Medicine. In addition to her private practice, she regularly lectures and contributes on topics including functional anatomy, physician wellness, and body-mind-spirit health at major medical centers, healthcare websites, popular magazines, and national fitness organizations. Learn more about Dr. Stephanie and her work at Imbodyment.com. Rebecca Gordon is a full-time astrologer, presenter, and columnist of the stars. Founder and creator of the nine-year-running My Path Astrology school, she teaches live and online courses year-round in New York City. Her astrological columns have been featured in Prevention Magazine, Condé Nast’s Epicurious, and currently she contributes monthly astrology articles to HarpersBazaar.com. Rebecca is passionate about teaching, sharing the language of the planets, and helping others to navigate their path in life.